7.0 g Net wt. 0.24 oz. March & twirl your way to pretty. It’s time to rally & rouse those cheeks! Twirl, tap and blend the perky color onto the apples of your cheeks with fingertips to look pom-pom pretty! 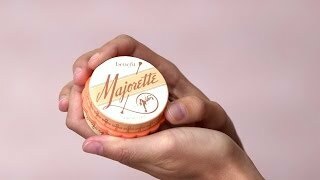 For extra pep and staying power, wear majorette under your favorite Benefit Box o’ Powder. Hurrah! The peach & pomegranate fragrance is chock-full o’ cheer! I love this cream blush, it is absolutely gorgeous and I use it every day!! It smells amazing too. I hope Benefit makes the smell as a perfume or eau de toilette!!! When I bought this blush at ULTA, I wasn't sure if I'd like it or get much use out of it because it was more of an impulse buy. I normally research products before I purchase them, so I worried after I purchased it due to it's price. I purchased it in the winter of 2015. In the winter I rarely used it and regretted buying it because once I had gotten it home it just sat on a shelf, literally. I had been putting it on with my fingers and when I attempted to blend it on my skin it moved my foundation around and the color was very splotchy, which wasn't a very nice representation of the product. So it sat, and sat, and sat on my shelf and I had to force myself to use it. then spring rolled around, and I have oily skin and so I tend to reach towards cream products when the weather is warmer and more humid, because they tend to last longer. A while ago, around in the beginning of spring 2015, I had purchased a small stipple brush at the drugstore for around $3, and I specifically bought it to use with a mousse blush from ULTA that I normally liked applying with my fingers. So I tried the mousse blush from ULTA with the new brush and I didn't like how it looked, so then I pulled out my Majorette and tried applying it with the brush and loved how it looked. It didn't move my foundation or look splotchy. So I began to use it more often in the spring, it wasn't my favorite, and it wasn't something I would use as my everyday blush, it was just too peach for me back when I still had my fair, winter skin. Then summer started. Now I love using bronzer and a bronze contour with my warm skin tone, and I was looking through my collection for the perfect bush to compliment that warm bronze yet matte summer glow I was looking for. and after my skin quickly tanned to about two shades darker to my normal summer and fall light skin color, Majorette became the perfect everyday blush. It is a peach color that appears orange in the packaging in some lighting, has a slight coral look when swatched, and has brown, orange, and coral tones to make for a true peach when worn on light, warm skin, preferably with a neutral bronzer, not to orange so that Majorette's peachy coloring shows true. After getting a little tan (don't worry I always wear sunscreen when I'm going to be outside for an extended amount of time) and working a neutral bronzer into my everyday makeup routine, this has become my perfect everyday blush because of the color. Now it claims to be cream to powder product, not unlike other brands claiming to have cream to powder products. But this product begins like a slightly dry cream formulation in the packaging and then when applied becomes much more dry and after applied in 5 minutes to an hour or two will become the most like a powder that it will become, which I feel may be different on different skin types. On oily skin it may never become a true powder while on dry skin it may become a powder yet still having the lasting powder of normal cream makeup. It is matte and stays matte unless you begin to perspire. It has a dry citrus like sent that is quite pleasant but fades as soon as you are done with it's application. I hope any and every person that read my account found it informational and helped you decide wether or not this product is worth it's price for you. I realize that this review wasn't aimed towards all skin tones and colors, but my skin is either fair with combination skin and neutral in tone in the colder months or light, warm toned and oily in the warmer months therefore I am unaware of what it would look like on other skin types, tones, and colors, I don't want to make any guesses for guesses aren't always accurate enough to provide any information and may be unintentionally misleading. I absolutely love 'Majorette' it's easy to apply with your fingers and it looks gorgeous! It gives you just enough blush for everyday! Also it smells fabulous! 'Majorette' makes me feel pretty! A really good blush for everyday and it looks really natural. I use it alone but it is also really good to use under another blusher. It smells AMAZING and the packaging is so cute. The little print on the blush is really cute too. I really like the consistency of the bush and color, but you have to be careful to not over apply while also applying the right amount. I had to reapply throughout the day but liked the natural look. This is hands down the best make up product I have purchased from Benefit. Awesome color, adorable packaging, and a very appealing scent. I highly suggest this. I think it was last summer while I was still on holidays when I saw this in the website, that I thought: "Another new, lovely product. What a pity it's still not available anywhere..." Some weeks later, one day after work, I visited one branch of our local department store for more Bathina and I saw this cutie of a blush booster and, of course, first of all, wanted to have it tried on. The very original package catches anyone's eye, and the smell is lovely. Needless to say, I bought it. The peach shade makes the product ideal to be worn solo on your cheeks (it looks great), but of course it's a wonderful partner/booster for any Bo'P. The first Bo'P I used this with was Sugarbomb, followed by Rockateur and the Gimme Fever blush in the The Rich is Back kit, and also with a little bit of Watt's up!. I've yet to try it with a cheek/lipstain; it's got to look very nice as well. I wasn't sure what to imagine when I heard about Majorette as I'd never used a cream blusher. After using Majorette for 1 week I am absolutely in love!! Despite my paleness the colour suits me and is really buildable. I put mine on with a sponge but any method would work. I tend to use it as an amplifier and use one of my box o powders over top. I've not found a combination that doesn't work yet! Also it would be impossible not to mention the amazing smell!!! Soo yummy!! I was skeptical to put this under a pink blush, as its very peachy. But I tried it under Hervana and I'm so glad I did! It really made the blush color pop and my blush lasted all day. It can easily be worn alone for a very natural flushed look. It also smells delightful! "Majorette" is the perfect compliment to your cheeks. The extra pop is there,whether it's worn alone or under the blush of your choice. A wonderful product and a must buy! I really enjoy this blush! It is so light feeling and has a lasting color. I absolutely love the smell of Majorette! Its Lovely, like a splash of sunshine on your face. It's a lovely warm peach shade, lasts all day, good color payoff. Can be worn alone or under your favorite box powder. Love this new blush. Peach-tone works well with my asian skin tone - highlights my cheeks perfectly while still looking natural. It's versatile/buildable for when I want my cheeks to really pop, vs. when I want a more subtle highlighting. Just a quick swipe on each cheek and I'm good to go! Plus, the scent is AMAZING. I received this product recently and it has quickly become one of my favorites. It's so silky, smells great and the color is perfect. I wear it alone or under hervana. I could put on majorette and They're Real and be set for the day! Love love love! Majorette is great because it's a flattering warm peachy shade that can be worn solo or with other box o' powders. Wearing alone gives you a hint of natural color for a low maintenance look. The smell is lovely and the color lasts...what more could a gal want? I am lucky enough to work for Benefit and have recieved my gratis for this product Never been a fan of cream blush but this is amazing. I noticed the colour on one of my trainers at a meeting and wondered what it was. the colour is so perfect for me it goes on beautiful and smells great and the campaign for it is fab!! cant wait to start selling!!!!!!!! I was lucky enough to get my hands on this a few weeks ago, and I fell in love from the first touch! Not only is the packaging absolutely adorable, the scent is amazing! It's feels very light on my skin, and doesn't clog my pores. The color is beautiful, very natural like a light flush, when used alone. I love to use it under Hervana, it just makes the color pop! Majorette is destined to become an icon in the cosmetics industry. Trust me, you'll want to try this! do you wear under or over Hello Flawless powder foundation? I would like to know whether it would be best to aply under or over my hello flawless powder foundation. Thanks! Can this be used under a cheek/lip stain?